Here we will look at microphones only. Microphones and their usage is a vast subject on its own. We will only attempt here to look at the basic usage of microphones from a live perspective only. A microphone is a device used to convert acoustical energy into electrical energy. Such devices are called transducers. We will not get into too much theory here, but let’s rather look at how to get the most out of microphone usage from a live stage application perspective. 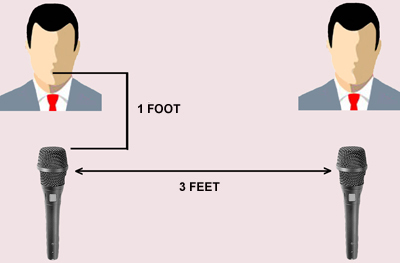 The inverse-square-law refers to the amount of reduction in output a microphone will have depending on the change in distance of that microphone from the sound source. If the distance between the microphone and the source is either doubled or halved, the change in level as a ratio of 4:1 or 6 decibels (dB). 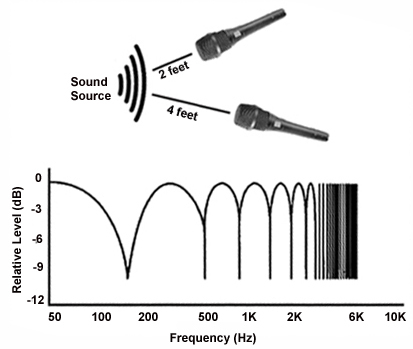 Therefore a change in distance from 10cm to 5 cm will make the microphone output 4 x greater. 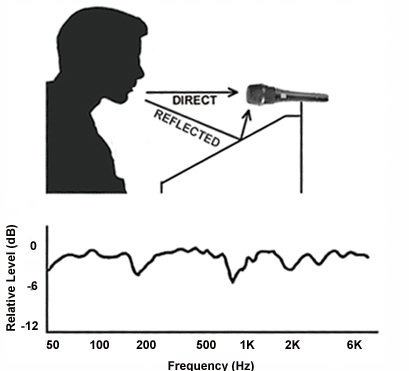 Directional microphones by the nature of how they work exhibit what is called proximity effect. This is the effect of the bass frequencies increasing more than the mid and higher frequencies as a directional microphone is brought closer to the sound source. This acts as a “Bass Boost” to the microphones output response. For vocals this has the effect of what is called “popping” of sounds such as the letters “P” and “B” during speech etc. The simple remedy is to reduce the bass output of the microphone by either reducing the bass of the microphone channel on the mixer by between 3 to 6dB of bass cut, or switching in a high-pass filter on the mixer channel if the mixer has this facility. For a guitar amplifier, the closer the mic to the grille, the fuller the amplified cabinet will sound over the sound system. As sound radiates from a source it bounces off nearby surfaces, causing a natural decay of sound within the room. This decay is called reverberation and every space has it. When a microphone is used within a reverberant space, it cannot discern between the direct sound of the source and the reverberation. It picks up both. The closer the microphone is to the source, the more the direct sound of the source will dominate over the reverberant sound. Conversely, the further away the microphone is away from the source, the more dominant the reverberation will be. Is closer or further away better or worse? Depends on what you want the microphone to hear. Closer will give you a very direct, dry sound. Further away will be more musical and natural sounding. The important thing here is recognising and understanding the difference. Phasing probably has more influence on the output of a microphone or multiple microphones than anything else. There are basically two influences that result in phasing of the microphone output. Sound takes time to travel over any distance. The average speed of sound in air is about 300meters/second. Sound therefore takes about 3.3 milliseconds to travel 1 metre. What happens is that any reflected sound off a surface that arrives in less than 10 milliseconds causes a phenomenon called constructive and destructive interference or comb filtering to occur as the direct and reflected sound combine at the microphone capsule. The same thing occurs when two or more microphones picks up the same source and each microphone is a different distance from that source. 1. Use as few microphones as possible. With each new microphone there is the increased chance of comb filtering taking place in the final mix. A good rule is to make the minimum distance between microphones at least three times greater than the distance between the microphones and sources. Also fewer microphones provides more gain in your system before acoustic feedback. 2. Keep microphones a least 1 metre away from reflective surfaces such as walls, drum screens and floors. 4. Keeping in mind the proximity effect and direct reverberation ratio, try to mic as closely to the source as possible. This gives maximum microphone output, thereby reducing acoustic feedback (Another topic in itself), minimizing comb filtering and giving a clean, direct sound. TomCat wrote: The simple remedy is to reduce the bass output of the microphone by either reducing the bass of the microphone channel on the mixer by between 3 to 6dB of bass cut, or switching in a high-pass filter on the mixer channel if the mixer has this facility. Is this what my mixer refers to as a 'low-cut' switch? I engage this on my vocals channels, but not on the channel carrying the line feed from my guitar (via the GT6). You agree with not cutting on the guitar? Great post, Tom. Learnt a stack. You can also use it for the guitar channel as well as the filter is usually set to either 80 or 100hz thereby cleaning up the guitar signal. I use a high pass filter on all my guitar channels as I mic up amps on stage and this reduces the chance of bass feedback off the mics. Best is to try itand see if it improves your guitar sound. Typically where you do not use a high pass filter is on tracks, bass guitar and kick drum. TomCat wrote: You can also use it for the guitar channel as well as the filter is usually set to either 80 or 100hz thereby cleaning up the guitar signal. I use a high pass filter on all my guitar channels as I mic up amps on stage and this reduces the chance of bass feedback off the mics. Best is to try itand see if it improves your guitar sound. Thanks....and there is plenty more where that came from......Just takes a bit of time to put it all together. I'm in Durban this weekend doing some workshops so I won't get a chance to add any more until next week. Not sure if this is the right thread to ask it in.. but, for what reason would one use those foamy type cover you get for mics? Is it neccessary to use it or does it influence the sound too much? Windshields. They come in handy in outdoor situations where you're getting wind noises, but do dull the high end a little, so are only used when needed. Alan Ratcliffe wrote: Windshields. They come in handy in outdoor situations where you're getting wind noises, but do dull the high end a little, so are only used when needed. +1 on that Alan. Personally don't like the foam windshields and only use them outdoors in windy conditions. I never use then indoors....they remove too much vocal presence from the microphones. Any good vocal mic will already have an internal foam windshield under the grille anyway. TomCat wrote: Any good vocal mic will already have an internal foam windshield under the grille anyway. More of a pop filter really, just enough to help with the rush of air from the plosive consonants (P, T, etc.). Not really enough for windy outdoor situations. Technically the same job (breaking up rushes of air before they hit the mic's diaphragm), but I prefer to keep the two separate in my mind by calling the internal a pop filter and the external a windshield. @ Alan...Absolutely right. The internal pop filter will do little in windy conditions outdoors.